Gourmets of Galway have an exciting year in store as the city and county have been chosen as the 2018 European Region of Gastronomy - the first time the award has gone to Ireland. 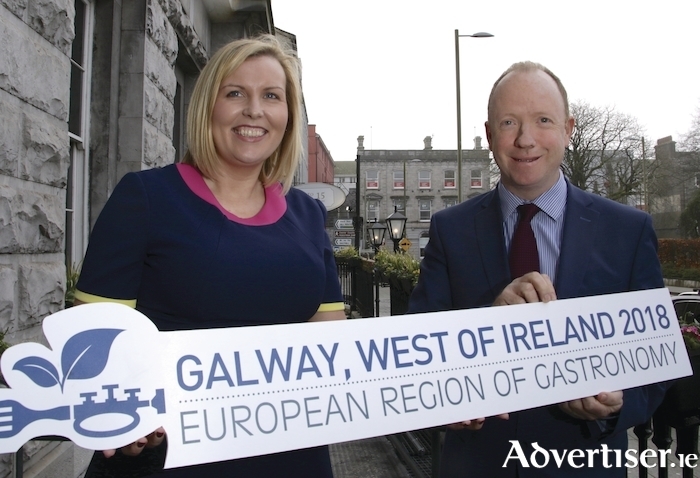 Last Thursday, at the Hotel Meyrick, I sat down with programme co-ordinator Elaine Donohue and the Galway County Council’s Alan Farrell, one of the programme’s four executives, to hear about their many exciting plans for the coming year. Alan first outlined how Galway came to win this prestigious designation. “We started the journey in September 2015 with a workshop in the Salthill Hotel to determine if the local community and various stakeholders wanted to go for the European Region of Gastronomy Award,” he says. “There was a turn-out of over 100 people and they were very supportive of the idea. They saw it as not just a lead-in to the 2020 Capital of Culture but as an opportunity to develop key areas and initiatives around the food sector. "At that meeting five priority areas were decided upon - supporting SMEs and innovation, health and education, cultural diversity, linking urban and rural, and sustainability. That commenced the process and then Galway County Council, as a lead partner, along with Galway City Council, GMIT, and Teagasc, went through the whole thing in terms of engagement with all the various stakeholders and developed a number of projects for the bid book that we want to deliver as European Region of Gastronomy. "The EU adjudicators were impressed with the strength and innovation they saw within the food sector here, the strong artisan presence, and the links with agriculture and marine in the area. We have worked with stakeholders across the public, private, and educational sectors and an area that is very strong in Galway is community. The programmes we are delivering build on all those key players. The enthusiasm shown by community for the Gastronomic Heritage Project with our heritage officer Marie Mannion has been phenomenal and the amount of data that has been collated will be a fantastic legacy out of this year. Elaine Donohue is from Kilbeacanty just outside Gort, where her family has a dairy farm. Her wide-ranging “foodie CV” includes stints working with Lidl and Brady Family Ham as well as a Bord Bia fellowship based in London. Galway’s Region of Gastronomy award gave her the welcome chance to return to the west and apply her extensive experience in implementing the programme. “We have a wide range of activities for 2018,” she tells me. “Our overall theme is ‘From the Ground Up, Feeding our Future’ and it’s all about sowing seeds. We have a one-year plan, a three-year plan, a five-year plan around developing our future. Within the main theme we have five strands and each of our four partners are championing one of them. Elaine expands on some of the individual events and initiatives. “One of our collaborations is with the Irish Hotels Federation, whose Connacht branch got involved along with the Restaurants Association of Ireland," she said. "They are providing a joint showcase of local chefs from each of the hotels and also local producers. It’s a night where the full hospitality industry will be present. The idea is to get small businesses working together more. "As part of that we’ll be pushing our Food Charter which people can link to on our website but we’re asking hotels, cafés, pubs, restaurants, to join up as well as part of the Region of Gastronomy and to feature a dish each month on their menus that is entirely locally sourced and also to have their menus comprise 30 per cent of local produce. The Year of Gastronomy officially launches on St Brigid’s Day, at the start of February. As Elaine points out, it is also "the old Celtic feast of Imbolc, ‘in the belly’ so that’s why we’ve chosen it for our launch date,” Elaine explains. “Looking ahead, on St Patrick’s Day throughout the city and county we’ll celebrate food and gastronomy, asking the city, towns and villages to take on events around either the smaller themes or overall theme of the Gastronomy year. Alan adds: “Some events will be geared to the public, others will be geared toward trade bodies, others will be community based so it there’s a broad range. Our website, www.galwaygastronomy.ie, has more information and details of all the events. Food tourism is evolving and we can use this Region of Gastronomy programme to extend the season and create local employment. While economic side was a big driver, we are also strong on social inclusion and culture so all that will feature. So, a scrumptious feast of food-centred treats await Galway in the year ahead. Tuck in!